Sports Labs- Base Design & Construction - Get it Right! Base Design & Construction - Get it Right! The refurbishment market is now mature and in some countries, this accounts for up to 50% of overall sales. An interesting and worrying observation we see whenever we are involved in the refurbishment of old pitches is the legacy of poor base construction found in facilities that are 10 to 15 years old. More often than not, when the base of an old pitch is exposed we find serious issues with it. This typically results in an unanticipated need to source or expend funds to deal with poor design, irregular construction practices or poor materials selection at the time of construction. In the worst cases, it means the pitch requires a wholesale reconstruction which adds a huge cost to the project budget. Have we learned anything from the approach taken back in the day? The short answer is no. We still see many pitches built to a recipe - an approach that provides a layering system based on what has always been done and not based on good design practices or even design that takes into account prevailing ground conditions. There is also a discussion to be had about the programming of works where funding cycles force construction to be done at a time of year unsuitable for pitches. Why is base design compromised? The practice of reducing the cost of the base of a pitch was founded in an attempt to take costs out of construction. When 3G artificial turf came along, it was an expensive product at four times the cost of what one would pay in today's market. A way of making a pitch project more cost sensitive, therefore, was to look at taking costs out. The result was a product sold with the asphalt layers omitted from the base structure – a base that the field hockey pitch designers and builders had included 20 years ago due to stone foundations being bumpy and prone to settlement. The resulting complications made them unsuitable for the exacting tolerances demanded by the International Hockey Federation. This attempt to reduce overall costs only compromised the base design and these decisions are something we continue to suffer today. The big problem we regularly see now is pitch base build solutions based on 200mm (8”) stone foundations without any reference to what that unbound, important structural layer will be placed on. Put simply, base design starts from the ground up. If the ground is not taken into consideration, then it's going to swallow up your pitch at some point. A lack of knowledge of the fundamentals of design means that pitch builder firms that compete with each other based on price are taking risks. If one contractor steps out of the "recipe approach" then they will be less appealing and will most likely lose a job on price. Proper design is added value and should be reflected in the tender evaluation of bids submitted for pitch construction projects. What can be done to improve the design approach? There are a few simple rules which are well understood. A proper site appraisal is very important. Historical data on the use of the site and how it has been altered over time can provide valuable information about what you can expect to find when you open up the ground. Old maps, local knowledge, a walkover of the site are just some of the tools that should be employed to carry out the feasibility study of the potential site. Site investigations which involve intrusive sampling and testing are best. Designing a site investigation based on the feasibility study is a sound approach. Issues such as drainage, bearing capacity, contamination, dimensions, and topography can be tackled. All of this information should feed directly into the design process. Carry out design practice based on the results of your site investigations. The good news is that designing a pitch base is not rocket science -- it is in fact grounded in highway engineering. It can be prescriptive based on what you have found in the site investigation or the base can be designed by plugging in data to a design package which will factor in information such as bearing capacity of the soils and soils types. What can be done to improve construction practices? One area that can cause serious problems for a sports field construction project is exposing a formation too early. 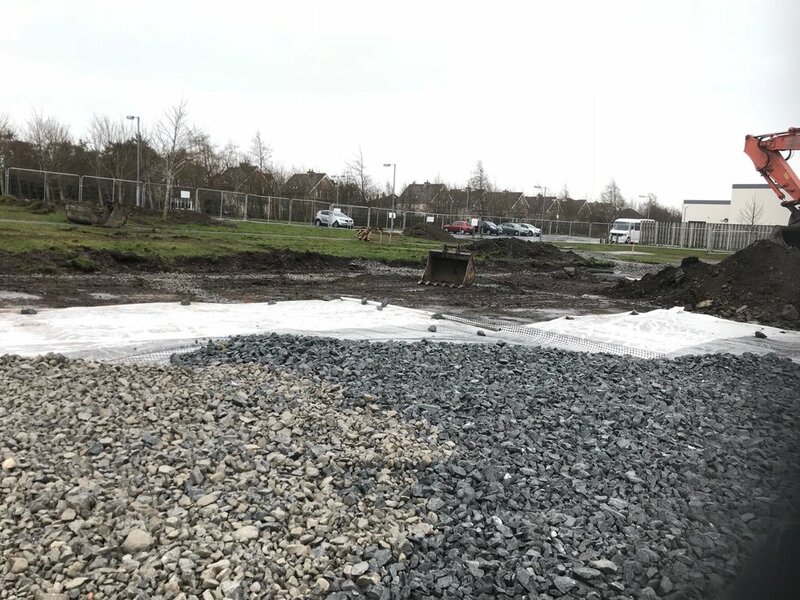 Too many times the subsoils are exposed and then bad weather sets in damaging what otherwise could have been a solid formation for pitch construction. It is vital that the formation is protected at all times because moisture, excessive trafficking or overworking can all have a detrimental effect on the formation of the field. When you suspect a weak, variable or sensitive formation build your way on to it by laying cutting and exposing only what you can work on that day and build your way onto the field. Unless you can prove you don't need them, use a geogrid. A geogrid is a membrane which is used to strengthen the formation prior to laying a sub-base. It can dramatically improve the bearing capacity of the soils. Doing this will provide appropriate bearing capacity in accordance with design. Using materials intended for use in field foundation construction is critical to the success of the project and it can mitigate settlement and problems with drainage. This step is key. Key stage inspections are a concept introduced by Sports Labs in the 1990s. It is a protocol which involves benchmarking the various layers from the formation (soils) to the asphalt (if installed). So what should be done at the various milestones in the construction process? The key benefit of using KSI's is knowing that when you find a problem, there is time to do something about it. Testing the layering works at milestone intervals in the construction process means you can stop and make corrections before a field is finally constructed. Using this method, you won't need to rip up the pitch to fix an issue -- or 10 years later when it's time to refurbish it.